Emmeline de Mooij (Delft, 1978), currently lives and works in New York and Amsterdam and has a very detailed collection of works. She works a lot with settings in photography and from what we see she often centers herself like an actor in her own works. From 1997 to 2002 she studied Fashion Design at the Gerrit Rietveld Academy. If you see her work, you can see that she’s not your ordinary fashion alumni because her works are a combination of a lot of disciplines containing, but not limited to: sculptures, installations, photography, graphic design, video and performance art. I guess it’s safe to say her work is Mixed Media galore. Where some alumni remain somewhat more linked to fashion, or at least to fashion within the ‘logical’ borders of fashion, I notice that there is an interesting thing that happens a lot during and after studying at the Rietveld. Something that I see less at other art schools seems to be more apparent there. The tendency to not-choose just one direction, but have a strong drive towards multi-disciplinary ways of creating their form of art. This is something that I not only see in the work of Emmeline de Mooij, but also in the work of other alumni like Felix & Mumford (Fashion, Installation, Graphic Design and more -), Soepboer & Stooker (Fashion, Graphic Design and more -) and for example the way Thera Hillenaar doesn’t just make clothes for wearing, but also adds a focus on it’s interactive function. The following images are taken from the solo exhibition ‘Strip it down baby, give me those bare necessities’ at the Steinsland/Berliner gallery in Stockholm. What I have mentioned in the above, becomes clearly visible in these photographic images. 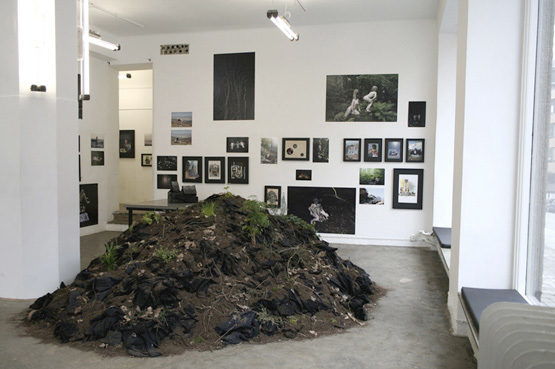 In the above work she spent weeks in European forests with her colleague Melanie Bonajo and together they researched and visualized how the modern man compares itself to the outdoors nature. I feel that from what I am learning now at the Rietveld, it is very important to try and focus on this collective unconsciousness, or somewhat try to approach and question the way you are thinking, and the way you approach a problem that you come across on your way to making a piece of art. This and the multidisciplinary approach to her works give me the feeling of a strong connection to the Rietveld. 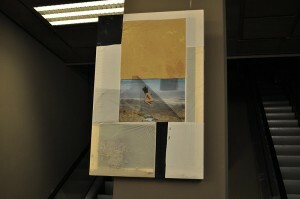 At the Fashion&FOAM exhibition in the Vijzelstraat, the work of Emmeline de Mooij was a real eye catcher. Not because of its colors, not because of its size, not because of its position, but because it was ‘different’. In an exhibition on fashion design, she chose not to show clothing or fashion photography, but to present a canvas with a picture of a jumping naked woman and collected sand, called ‘Gravity and Domestic Dust’. A very (strange?) personal approach to what fashion design is? How does she describe herself, and what –as an ex-Rietveld student- is her connection to the Rietveld after 10 years of graduation? As a reaction on her visual work, I chose a personal formal approach by sending her a letter full of loose questions, written on pictures of the Rietveld building and on photographs of her own work. 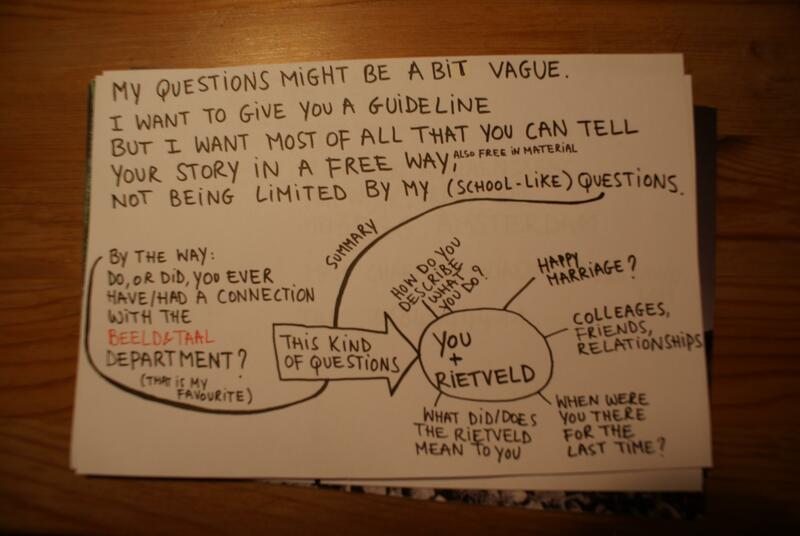 What I got back was not a complete story, not a letter either, but a bunch of answers giving a slight insight in the relation between this versatile artist and ‘our’ Rietveld. Emmeline de Mooij (born in Delft, The Netherlands, 1978) investigates in her installations, photo’s and performances, the human being looking for something to hold on, confronted with the sight of a dizzying big universe. Comfort and a therapeutic effect is often found in surrounding oneself with as much objects as possible. In her work she creates artifacts and remnants of fictional societies and scenes from apocalyptic scenario’s, removing the contradictions between the everyday and the improbable. 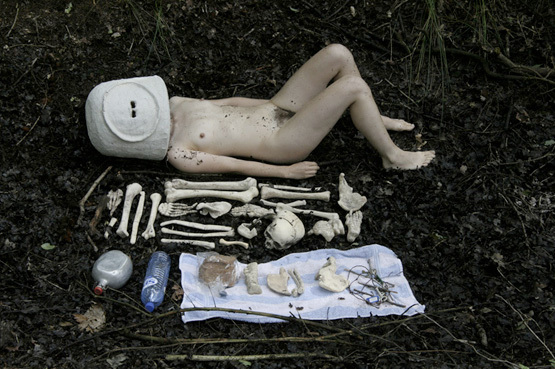 Materials such as clothing, utensils, plastic, clay and Styrofoam, she molds together into images referring to science-fiction, archeological finds and pseudo-scientific theories. The complex, with objects surrounded modern life and the nostalgic desire for simplicity, she captures in an ironic way. Where concepts of freedom and panic are inextricably linked to each other. Yeah, quite a happy marriage! 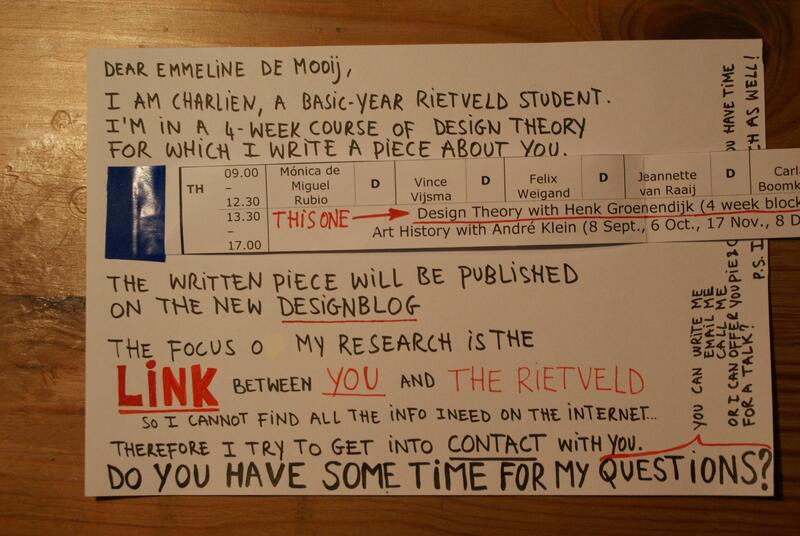 Although I wouldn’t describe the Rietveld at that time as a top level institute. I thrived well in the general focus at the Rietveld at giving the students a lot of freedom and responsibility, but I also think that there were a lot of not really good teachers. Teaching on a bad level, not up to date with developments within the international art world, or just not dedicated enough (absent all the time, sick, burn-out etc). I had the feeling some of those teachers where teaching there since ages, having this contract, so they were save for the next 10 years, they were friendly to the director and that seemed enough to keep their job. 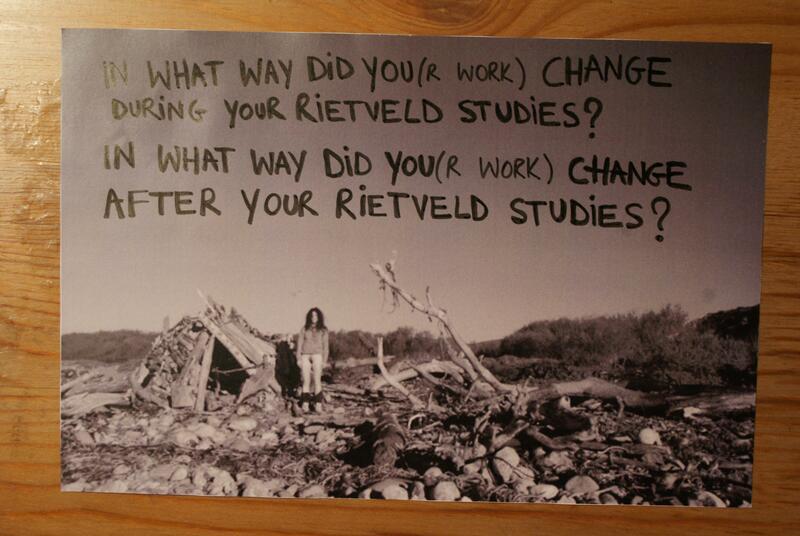 In what way did you(r work) change during your Rietveld studies? I guess, due to the fact the Rietveld being quite an international community, the same counts for Amsterdam where I moved to for my studies, my horizon was broadened. And I felt I could finally fully express myself, surrounded by like minded people, quite different from the provincial town I grew up. 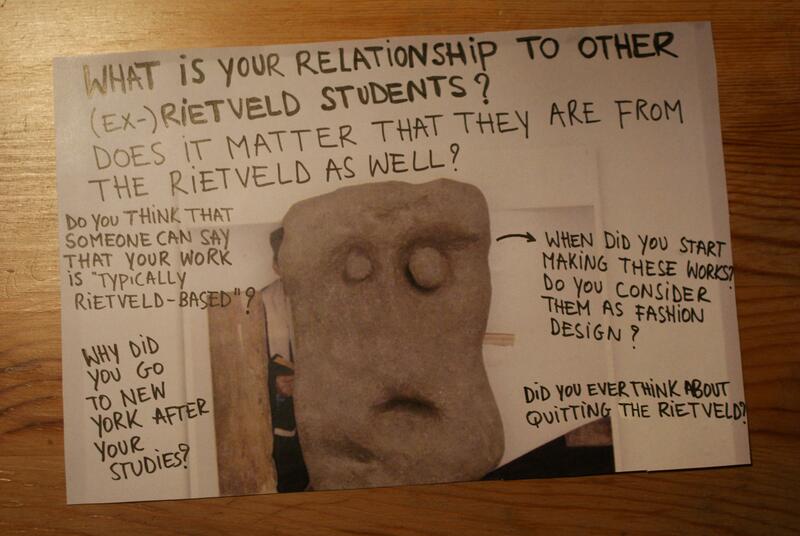 What is your relationship to other (ex-)Rietveld students? I have some friends that went to the Rietveld as well, maybe 30% of my friends? But I’m not one of those that keep hanging out with only Rietveld people, there’s quite a big community in Amsterdam that is like that. 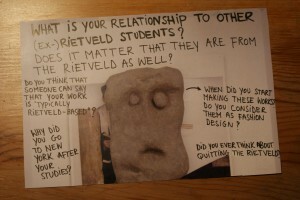 Does it matter that they are from the Rietveld as well? Do you think that someone can say that your work is “typically Rietveld -based”? To be honest, I hope not. I hope my work is not too strongly part of just one particular tradition. Although sometimes I have the feeling, especially compared to artists with a background in American art education, people who studied at the Rietveld have quite an elaborate/intuitive way of working, which feels to me more natural. 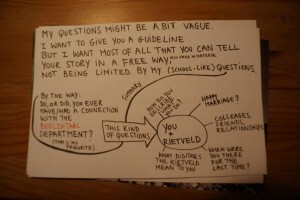 So I wouldn’t mind if people would connect me to the Rietveld in that sense. I can’t ignore though that my work can be typical Dutch sometimes. Especially in photography I think there is a certain approach that a lot of Dutch artists unites, “improvised” looking still lives for example, or snap shot like photo’s with strong flash light, the use of humor in the work. And many times I think Dutch art isn’t very political, again especially compared to artists with a background in American art education (for me this is a strong reference just because I recently lived/studied in the States for 1,5 years), artists here are not extremely engaged or making political statements. Why did you go to NYC after your studies? When did you start making these (canvas)works? Do you consider them as fashion design? I started making them in New York in 2010. I wouldn’t consider them as fashion design. Do you manage to draw the school-floorplan by memory? 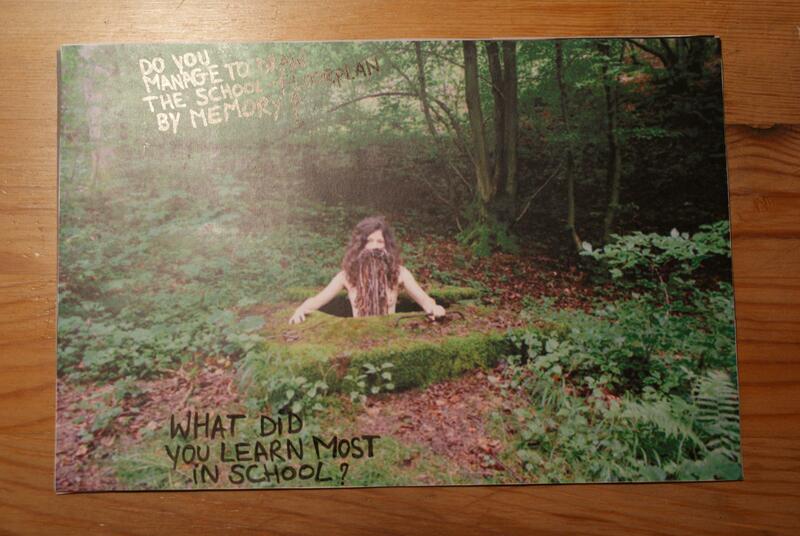 What did you learn most in school? 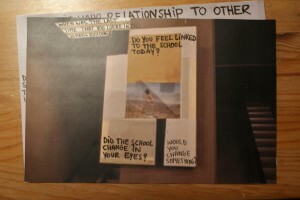 Did the school change in your eyes? If there are still these teachers that aren’t dedicated and not good at teaching, I would throw them out and really try to upscale the general level. 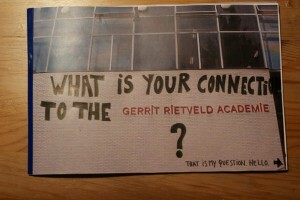 There are enough great artists and theorists living in or close to Amsterdam who could teach at the Rietveld. 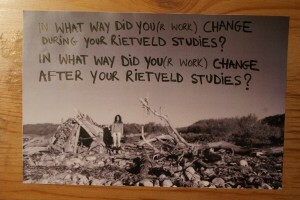 Did you ever think about quitting the Rietveld? When where you there for the last time? I think 2008, for the graduation show. 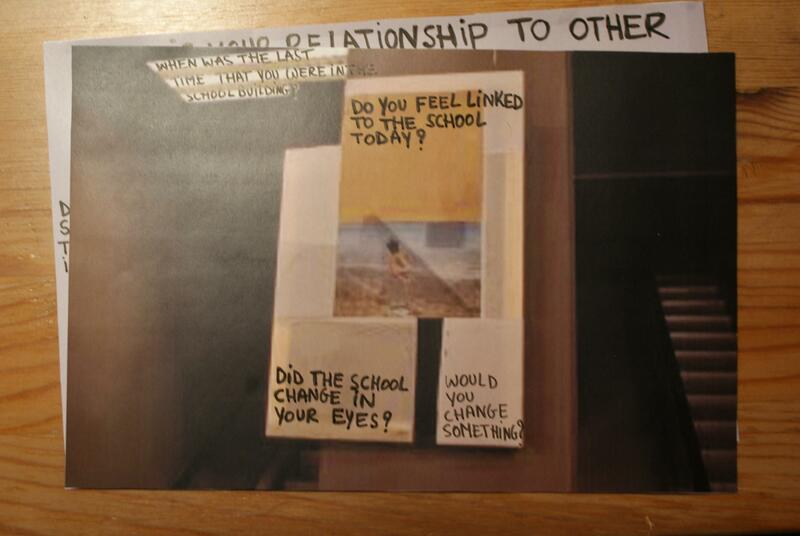 Do you feel linked to the school today? Not so much, although coincidentally two weeks ago or so I ended up at a lecture from the Italian thinker Bifo and I heard he was going to speak at the Rietveld Studium Generale the next day. So I checked the Rietveld website and some lectures looked interesting, but I had to finish some works for a show so I couldn’t go. But maybe definitely next time.